Volume 8 Page 1 of 4 THANKSGIVING EDITION! Decorative and Sculptural Ironwork and many other titles is writing a new book on blacksmiths and their work. While updating the long out of print Decorative and Sculptural Ironwork Dona was urged to write a new book on contemporary ironwork and the artist/blacksmiths that produce it. Schiffer agreed to publish her new work and she is now gathering photographs and looking for work to fill the new book. Unlike Decorative and Sculptural Ironwork the new book will be less of a how-to work and be a more inspirational work designed for both producers and buyers of artistic metalwork. 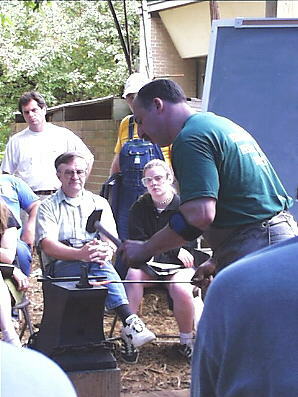 Peter Ross, head blacksmith from Colonial Williamsburg gave a 2-day demonstration of early blacksmithing techniques and materials here at the smithy of historic Fort Vancouver. He demonstrated period techniques of forging artifacts from the period that Fort Vancouver was occupied. Historic Fort Vancouver is a reconstruction, on the original site, and in most cases the original foundations, of the main Hudson's Bay trading post from the mid 1800's. Sited on the Columbia River, Fort Vancouver was the primary shipping port for the fur trade on the west coast of North America. The reconstruction includes a four-forge blacksmith shop that turned out hardware and made repairs for the widely-flung trading network established by the Hudson's Bay Company. Mr. Ross has been an annual visitor to this area, usually putting on a week-long workshop for area smiths. After a workshop on 16th century locksmithing (participants made a 16th century padlock), Mr. Ross put on the first demonstration at the fort that has been open to non-fort smiths.